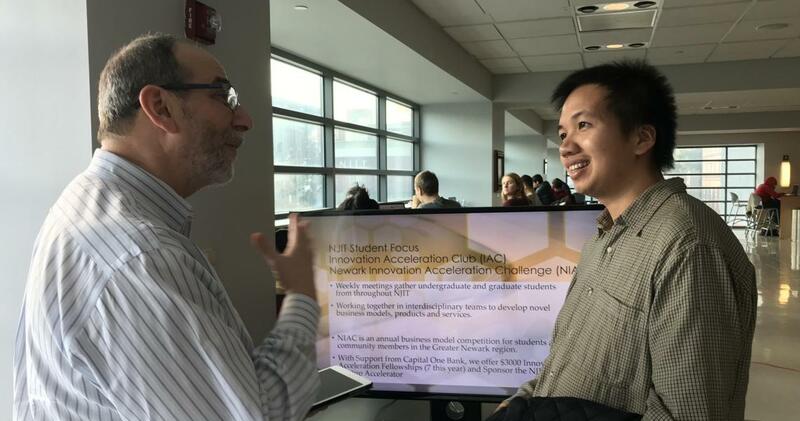 At this year's NJIT Research Centers and Laboratories Showcase, Phuoc Vu (right), a graduate student in electrical engineering, is pitching a sustainable energy concept to Michael Ehrlich, co-director of NJIT's New Jersey Innovation Acceleration Center. The days when corporate giants like General Electric and AT&T housed sprawling, multi-faceted technology hubs that nurtured inventions from bench to market are long gone. The demand for focused and timely applications remains. But in an era where promising ideas spring from locations as diverse as university research labs, start-up incubators and Silicon Valley networking sessions, the route between concept and useful product is unpredictable and often riddled with roadblocks. “The ‘bridge’ is the most difficult portion,” noted Vincent DeCaprio, vice chairman of the NJIT Board of Trustees and longtime veteran of the medical device sector, at the recent NJIT Research Centers and Laboratories Showcase. Keynote speaker Steven Schachter (below) was there to present the audience – directors and their teams from some of the university’s more than 70 research hubs – a road-tested solution: a model that guides projects through a 10-stage cycle that ensures teams make simultaneous progress in four key areas – technology development, clinical workflow, business and market planning and the regulatory pathway. “Getting from the ‘aha’ moment to the finish line is quite difficult, so we’ve analyzed the process and seen how it can go awry,” said Schachter, chief academic officer and program leader for neurotechnology at Consortia for Improving Medicine through Innovation and Technology (CIMIT), a consortium of research institutions, universities, military medicine centers and hospitals throughout the U.S. with international affiliates in the U.K., Spain and Singapore. CIMIT has guided development of technology ranging from advanced optical coherence technology (OCT) imaging to self-service healthcare kiosks. The $70 million the group invested in projects reaped $1.1 billion in follow-on funding. Initially, just over a quarter of its teams commercialized their technology, but since the organization developed an accelerator team to facilitate projects, that rate has jumped to 41 percent. Schachter presented CIMIT as a possible model for NJIT, which now has about $150 million in research funding and has expanded its campus-based R&D ecosystem to include an industry-focused innovation institute and increased engagement with its Enterprise Development Center. Over the past six years alone, the university has hired 110 new faculty members in strategic areas, “which represents a third of our staff,” as Provost Fadi Deek put it.